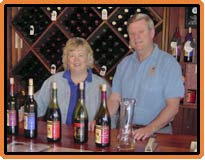 Christopher Creek Winery 641 Limerick Lane, (707) 431-8243. Tasting daily 11-5. Located atop a small hill and reached via a promise-filled drive up a narrow vineyard-lined road, this small family-run winery is a little like the pot of gold at the end of a rainbow. Only here it is mostly liquid red gold in the form of delicious wines—especially the Zinfandels and Syrahs. Two picnic tables are provided.